THE FOOTBALL ASSOCIATION of Ireland has confirmed it will propose eight-year term limits for board members at an Extraordinary General Meeting on Monday. Should the proposals be accepted it means Honorary Secretary Michael Cody and Honorary Treasurer Eddie Murray will not be eligible for re-election when their current term in office expires in 2020 and 2021 respectively. The move comes in order to comply with Corporate Governance Code set down by the Department of Transport, Tourism and Sport, which set a deadline of 2021 for the initiative to be implemented. 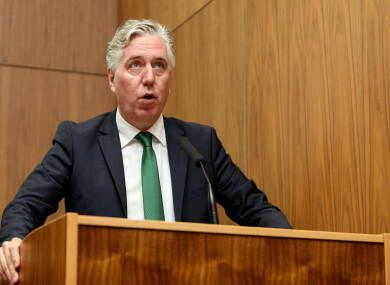 The FAI have also established a Governance Committee, consisting of the company secretary and two external members, which will review the Code and recommend further policies to bring the association in line with its demands. In addition, six board members, Eamon Naughton, Paraic Treanor, Jim McConnell, Eddie Murray, Donal Conway and Michael Cody will finish their terms in the next four years. Email “FAI will hold Extraordinary General Meeting to propose term limits for board members”. Feedback on “FAI will hold Extraordinary General Meeting to propose term limits for board members”.